Twenty Salmon Flies features in depth and detail the full range of classic salmon fly patterns from the simplest to the most complex. The twenty patterns together build on styles, types, materials, elements, and techniques. Learn to tie these twenty and you'll master the craft and the art of classic salmon fly tying. Each chapter successively presents patterns that are more and more complex. Chapter one introduces very simple Spey and Dee styles, strip wings with a few elements. Move on to simple upright wing flies, working with full feathers and married wing styles. A chapter focuses on flies with multiple body divisions and another is devoted to Traherne's exquisite (and challenging) Victorian classics. Once you've mastered these 20, you'll be able to tie any classic salmon pattern. Michael Radencich covers the classic patterns developed and fished throughout the nineteenth century and new patterns, modern variations developed in the last two decades. To further reinforce skills, Radencich has produced a two-hour DVD and has included an appendix of 100 patterns culled from his collection of sources. 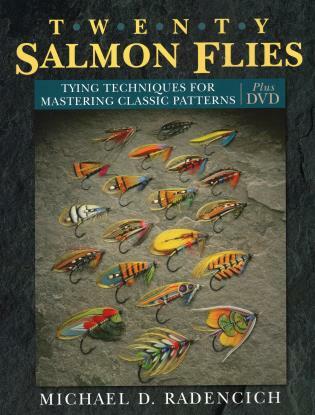 Whether you're a beginning classic salmon fly tier or more experienced with the classics, you'll find Radencich's newest book and DVD an inspiring and challenging reference. Michael D. Radencich has been tying classic salmon flies for twenty years. He currently produces websites and develops interactive DVDs; he is also a professional photographer, videographer, and painter. He lives in Weatherby, Missouri.